The Tartan sett is based on the Roxburghshire tartan because the Barony of Wells based in Jedburgh now belongs to Mr Bryce L West. 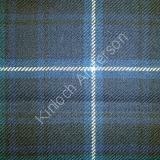 The chosen colours are the traditional navy and green often seen in tartans such as the Black Watch with the addition of a second blue for extra depth. The silver grey was a special request from Mr West.